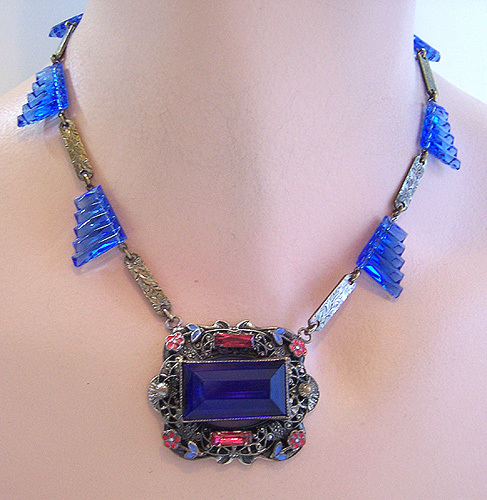 Simply ornate, gorgeous choker necklace in the Transitional style incorporates elements of Art Nouveau and Art Deco. Translucent cobalt blue are faceted and cut in a skyline or "step" pattern, to give the appearance of baguettes graduated in size. These alternate with silvertone metal bars, etched front and back with a floral design, and are attached with metal connectors and wires threaded through the glass pieces. The centerpiece consists of a 1" faceted unfoiled and open-backed blue glass rectangle, bezel-set, flanked by faceted pink glass baguettes and a filigree frame adorned with pink and blue enameled flowers. Though unmarked, this may be Czech in origin.